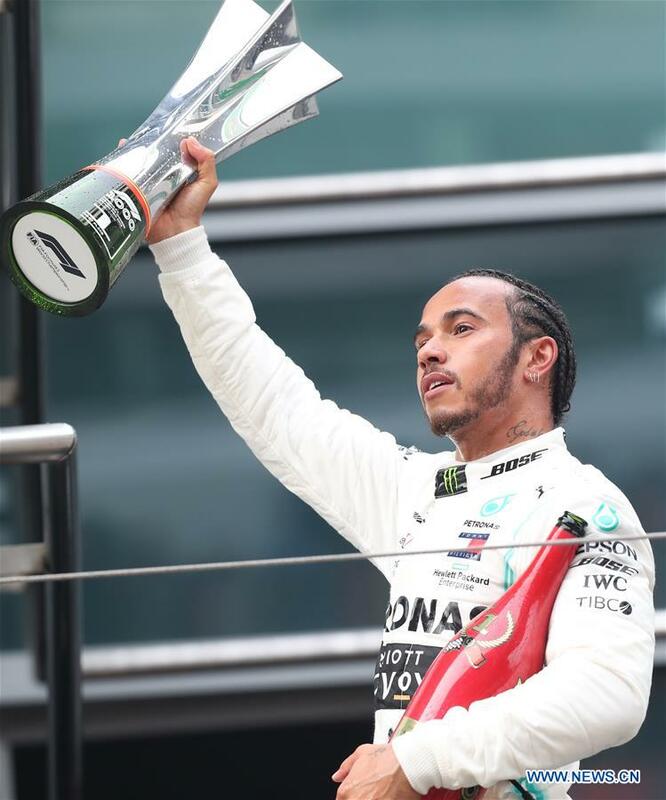 Lewis Hamilton beat teammate Valtteri Bottas to win the 2019 Chinese Grand Prix, with the Mercedes AMG Petronas team securing their third consecutive 1-2 finish of the season in Formula 1's 1,000th race. Though Bottas had qualified on pole position and had the measure of Hamilton earlier in the weekend, it was the Briton who got the jump on the Finn at the start, with a better getaway seeing the 44 Mercedes lead into the first corner. Behind them, both Ferraris also swapped places, with Charles Leclerc now ahead of Sebastian Vettel. While the front-runners all negotiated the first lap cleanly, there was drama further down the field, as the Toro Rosso of Daniil Kvyat made contact with the McLarens of Lando Norris and Carlos Sainz, both of whom required a trip to the pits for new front wings, putting them well down the order. Kvyat was handed a drive-through penalty for causing the collision in what would prove to be an untidy race for the Russian. The opening laps continued without much in the way of incident, though Vettel was soon on Leclerc's tail after the Monegasque lost time locking up into the hairpin. Though unable to overtake, the German appeared to have a quicker car than his young teammate, and the team controversially ordered Leclerc to let Vettel by on lap 11. By this stage, Vettel was five seconds adrift of Bottas in second place, losing time after himself locking up at the hairpin on lap 14, and by this stage it appeared as if the race was playing nicely into the hands of Mercedes. Clearly irked at having been ordered to let Vettel by, Leclerc radioed his team to say that he was now losing time behind his teammate, having closed on the German after his hairpin lock up. Vettel was the first of the top four to pit on lap 18, emerging just in front of Red Bull's Max Verstappen, who had pitted the previous lap after quietly going about his business in fifth place, and was soon looking for a way past the German. The Dutchman made a DRS-assisted lunge down the inside of Vettel at the hairpin but the Ferrari was able to edge back in front on the exit of the corner, nudging Verstappen onto the grass as he did so. Vettel was now setting faster lap times on his fresh rubber, prompting Mercedes to bring Bottas in for tyres on lap 22, the Finn emerging in third ahead of the Vettel-Verstappen battle but behind Leclerc, who stopped the following lap and emerged in fifth, while Hamilton was able to pit without losing his lead. With the dust having settled on the tyre stops, Hamilton now led Bottas by 1.6s on lap 26, with Vettel 7.6s behind the Finn in third and seemingly unable to cope with the pace of the two Mercedes. Elsewhere in the race, Alex Albon had been quietly impressive in his Toro Rosso, up into 12th place by this point after starting from the pitlane following a heavy practice crash. By contrast, his teammate Kvyat was having a torrid time, with a slow pit stop adding to his previous woes. The Russian made another unscheduled stop midway through the race for a new nose cone, and would ultimately retire from a forgettable race on lap 44. Kimi Raikkonen also looked in fighting mood, the Alfa Romeo driver overtaking both Haas cars within a couple of laps of each other to move up to ninth after his late pit stop. Albon soon also overtook the Haas of Kevin Magnussen, who was struggling with a lack of pace and was then passed again by Lance Stroll's Racing Point. Verstappen's second pit stop on lap 35 triggered all the front-runners to likewise, with Vettel following in on lap 36 and Mercedes notably double-stacking their two drivers on lap 37, with Bottas imploring the team not to make him lose time while his mechanics served Hamilton's car. But while the Briton once again emerged without losing his lead, Bottas found himself held up behind the Ferrari of Leclerc, who hadn't pitted and soon had his mirrors full of the Mercedes. After an abortive overtaking attempt at the hairpin on lap 38, Bottas made no mistake at the same point the following lap, but the time lost squabbling with Leclerc meant he was now six seconds adrift of Hamilton in the lead. That gap increased to 7.5s by lap 42, by which point the Finn had seemingly accepted that second place was the maximum he was going to achieve today. Vettel also made it past Leclerc, who came in for his second stop on lap 43, emerging in fifth place behind Verstappen but with fresher tyres than those ahead of him. The Monegasque was unable to make significant headway, however, and by this point the top six positions looked fairly set, with Verstappen's teammate Pierre Gasly at the rear of the leading group. Untroubled at the front, Hamilton took to team radio to ask who currently held fastest lap, the Briton clearly keen to maximise his points haul from a race in which his Mercedes team had been surprisingly superior over the Ferraris. That honor, however, ultimately went to Gasly, who took advantage of a big gap back to Daniel Ricciardo's Renault in seventh to pit for fresh rubber two laps from the end without losing a place, and the Frenchman duly nabbed fastest lap and an extra championship point on the very last lap of the race. Elsewhere, Ricciardo finished best of the rest behind the top three teams in seventh spot, followed by the Racing Point of Sergio Perez, who notably made up four positions on the opening lap. Raikkonen was ninth for his third points finish in as many races, and an impressive drive from the pitlane saw Albon take the final point in tenth. The day, though, belonged to Hamilton, who serenely led every lap of the race after assuming the lead at the first corner, a far cry from an untidy Friday practice session in which he spun and claimed he was at a loss as to what was wrong with his car. "It's not been the most straightforward of weekends, but what a fantastic result for the team," said Hamilton after his 75th Formula 1 race victory. "To have a one-two is really special, the start was where I was able to make the difference and from there the rest is history." While Hamilton had made a perfect start from second on the grid, Bottas rued his poor getaway that set the tone for the afternoon. "I lost [the race] at the start, otherwise the car was okay and the pace was similar. I got some wheelspin over the white line [after the starting grid] and lost it there." Meanwhile, Vettel seemed resigned that Mercedes were quicker than Ferrari when it mattered this weekend. "We tried to stick with them, but we just couldn't. They were too quick, right from the start." The result sees Mercedes continue their perfect start to the 2019 season, with three 1-2 finishes in as many races. Hamilton's win takes him to the top of the drivers' standings for the first time on 68 points, six points ahead of Bottas with Verstappen already some way adrift in third with 39 points. The next round of the 2019 Formula 1 season is the Azerbaijan Grand Prix on April 28.